This week I want to focus a little on arguably the most important ingredient in bread - flour. We use a variety of flours in our baking here at River Cottage HQ and each one has its own distinct flavour and properties. Our flours come from local mills, most of whom mill traditionally using two large stones the crack and crush the wheat. These stones are powered by wind or water and you can still see them working at @thetownmill in Lyme Regis. The flour is then either sieved to remove the bran and germ for white flour or left as it is for Wholegrain. There are also many ancient grains that can be used in bread and we add them to our doughs to achieve different flavours and higher nutritional value. Spelt is the most common of these and is thought to have been unaltered for thousands of years. We get ours from @sharphampark and it has a beautiful nutty flavour. To get a darker, stickier loaf I would add a dark rye to the dough but there are many rarer ones worth exploring too! 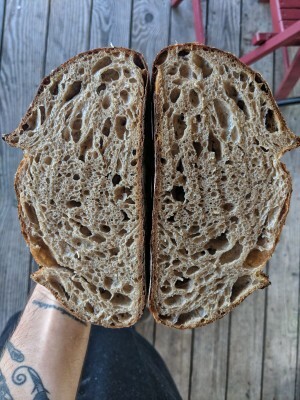 The amount of wholegrain flour you add to the mix will affect the rise and crumb structure of the loaf so it’s worth keeping in mind what you want to achieve. The more of it you use the heartier your loaf will be but to balance that with a lighter loaf we need to add some strong white flour. The strong part of this (which we get from #stoates or @shiptonmill) relates to the protein content of the wheat (usually between 11-15%) as it is this that bonds with water to form gluten. The more protein, the stronger the gluten and the better risen your bread will be. But white flour only contains one part of the grain, the endosperm. Wholegrain flour on the other hand uses, you guessed it, the whole grain and therefore also contains the bran (or husk) and the wheatgerm where most of the nutrients are stored. It's that bran that pops the air bubbles as the dough ferments, however, preventing big, open holes. There are many types of loaf but my favourite is definitely somewhere in the middle - the best of both! To learn more about baking why not join us on one of our bread courses throughout the year? See you next week! Hello! It's Mark back again to talk about sourdough for my second #sourdoughseptember post! I hope you've been inspired to do some baking this week! 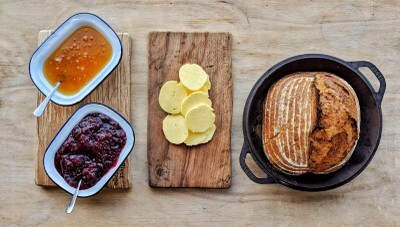 Today I wanted to talk a little about the equipment I use when baking the bread not just down here at River Cottage HQ but also when I'm at home. 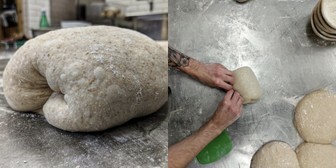 The right tools can make life a lot easier and improve your finished loaves immensely. There are 5 things I use all the time. The first is a good set of digital scales. The more accurate you can be when you weigh out your ingredients the better. Sourdough is such a delicate thing that you really want to make sure you have the exact right amount of everything, particularly when you are starting out on your baking journey. They are inexpensive and invaluable. The next is a dough scraper. This bit of plastic doesn't look like much but is so useful when moving around sticky dough and shaping the loaves that I wouldn't be without one! I talked about the bannetons or proving baskets a bit in last week's post and they do a wonderful job of holding the dough in place to provide structure. Once the loaves are ready to bake I use a cast iron pot or a Dutch oven to get as close to a bakers oven as possible. The reason why they work so well is the heavy metal pan holds a lot of heat whilst the lid helps to create steam. Almost like an oven inside an oven! This steam and extra heat helps the bread to rise as much as possible before forming a crust so we get a lovely, well risen loaf. Just before the loaves go into the oven we need to score them with a sharp knife or a razor blade. Scoring helps the steam to escape from the bread as it bakes, creating those destinctive 'ears' or ridges along the top. 40 minutes later and you'll have a perfectly baked, golden brown loaf. And that's it! Of course you can bake beautiful bread without any of these things but they certainly help to make the best loaves possible. If you're interested in learning more about sourdough or baking in general we still have spaces on our two day sourdough course this coming week (17th and 18th) and our general bread days run throughout the year. I'd love to see there. See you next week! Baking for large numbers requires slightly different techniques to doing it at home but the general principles are the same. The first picture shows the initial problem, it's heavy! We bake 9kgs of dough a day which produces 11 loaves. More than enough for all our guests (and the odd hungry chef!) I like to bake with a blend of flours, some stoneground organic bread flour from #Stoates and a good amount of Sharpham Park wholegrain spelt or The Town Mill milled Tamarisk Farm wholemeal. These wholegrain flours provide nutrients and a rich nutty flavour to the bread. After the initial fermentation, it's time to shape the loaves and get them into banneton baskets to help them retain structure on the final proof. Then we pop them into the fridge overnight to slow the fermentation and develop flavour, with the added bonus that they are ready to bake in time for breakfast! My favourite part of the day is opening the oven to lift the lids on our Dutch ovens to see how the bread has turned out - it's a joy to see. Finally it's time to wait patiently for the bread to cool before slicing into it to see those big open holes or crumb as it's known. If you'd like to know more about baking please do consider joining us on our Two Day Sourdough course on the 17th and 18th September or our Bread Making courses throughout the year, it's a wonderful skill to learn and will definitely be the best bread you've ever tasted! I'll see you next week for more tips and tricks!